I love drinking my pregnancy tea everyday! I keep a pitcher of this wonderful stuff in the fridge ready to go whenever I need it and often have to make a double batch because my family loves to drink it too. The flavor is so delicious and lightly sweet that I rarely add honey or stevia when enjoying my quart for the day. I did not drink any kind of pregnancy tea with my first baby, but was introduced to it to by my 2nd midwife when I was pregnant with Tabitha (my 2nd). She had her own pregnancy tea recipe and made it for all her mamas. I was hooked on it from my first drink and I loved how it made me feel! So, when I became pregnant with Tobi (baby#3)… I knew I had to get that recipe from her and after doing more research, decided to add in 2 more herbs to create a more potent tea to improve overall health of myself and baby, thus the name “Super Happy Belly Tea” was born! Now, before you read on, I have to say this for legal reasons… consult your midwife or doctor about any changes you make to your diet while pregnant. 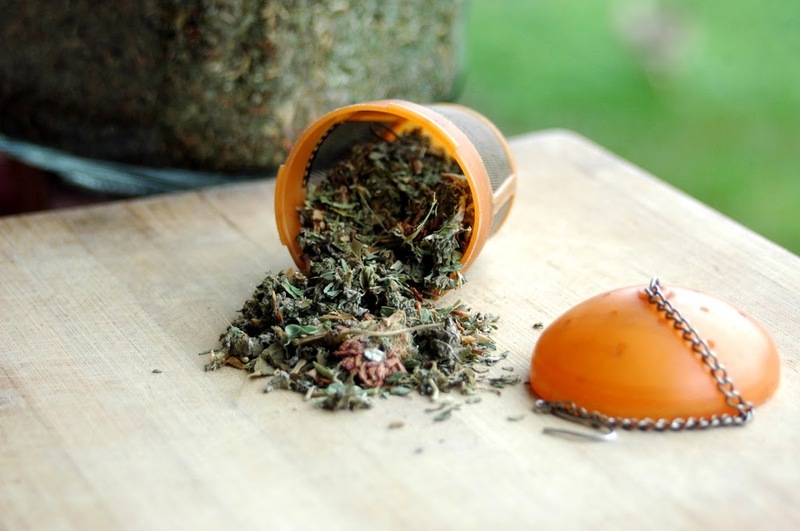 Herbs can cause interactions with pharmaceutical drugs, and just because they are natural, does not mean they are safe for everyone. With that being said, the use of herbs in pregnancy has a long, safe record in human history! Red Raspberry Leaf: This herb is every pregnant mama’s best herbal friend! It is the best single herb that we can take for total uterine health. There is a long list of vitamins, minerals, and nutrients that the uterus needs to work efficiently. Red Raspberry Leaf has basically all of them! It is filled with essential minerals and vitamins like magnesium, potassium, phosphorus, vitamin C, E, A and B complex. It also contains easily assimilated calcium and iron. This mama’s best friend increases fertility, tones the uterus, aids in easy birthing, restores the womb after birthing, helps prevent miscarriage, reduces morning sickness, soothes muscle/leg cramps and backache, and counters fatigue. 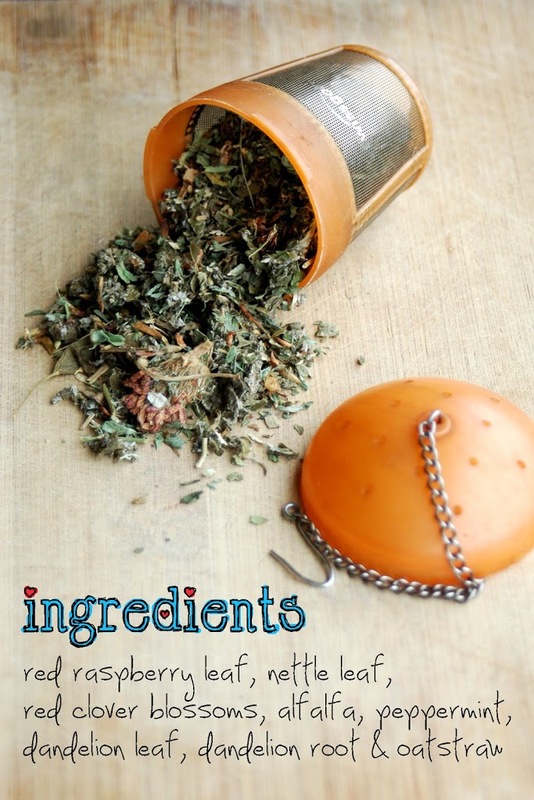 This herb is not only great for mama and baby, but for the whole family… read more here! Nettle Leaf: You will find that nettle supplies amazing amounts of energy! It is rich in chlorophyll, a significant source of vitamins A, D, C, B, and K, bio-available minerals, including huge amounts of calcium, magnesium silicon, and potassium chloride; protein, and dietary fiber. It prevents folic acid anemia and iron deficiency anemia, and is also a digestive aid, a strengthener to the lungs, an ally of the kidneys, and a restorative to the hair and skin. It has the ability to increase the efficiency of liver and kidney function, which very important during pregnancy. It also helps prevent varicose veins and hemorrhoids, eases leg cramps and backache, reduces the incidence of hemorrhage after birth, and increases the richness of breast milk. Red Clover Blossoms: This is a herb that you may encounter as not recommended for pregnancy. I expressed my concerns to my 2nd midwife and she referred me to this trusted informative article which states “The infusion [red clover blossoms] prevents and eases the constipation so common during pregnancy. It also strengthens the liver and improves appetite, especially when morning sickness is a problem. And it relieves anxiety.” Red Clover, like alfalfa, contains chlorophyll and has been called by herbalists a “God given remedy”. These flowers are used in folk medicine as a cure for any cancerous lump or tumor and its alkaline qualities purify the blood. It is used to treat infertility and the generous amounts of minerals, proteins, antioxidants, and phytoestrogens in red clover restores health to the entire reproductive system (great for men too!). Red Clover is an excellent herbal source of calcium, chromium, magnesium, phosphorus, and potassium. Plus, it is valued for keeping breast milk rich and our breasts healthy! Alfalfa: Called the “king of plants”, this herb is supremely rich in vitamins and minerals including iron, calcium, magnesium, phosphorus, sulfur, chlorine, sodium, potassium, silicon, and trace elements. It has 8 essential amino acids and the highest chlorophyll content of any plant. Alfalfa help aids in relieving morning sickness, prevents anemia and hemmorhaging. Midwives often recommend Alfalfa instead of an iron supplement to help us mamas build red blood cells. Alfalfa also contains a little known, but very important, vitamin – Vitamin K, which helps with blood clotting needed for mama & baby after birth. Peppermint: Mostly used in this tea for its soothing flavor, Peppermint is also helpful for alleviating symptoms of heartburn so common among pregnant mamas. It is also good for all digestive problems, expels stomach & colon gas, promotes relaxation, cleanses & tones the body and it can be used instead of aspirin for headaches. Dandelion Leaf & Root: This amazing herb is one I decided to add into the mix to create a more potent pregnancy tea after reading this article and doing more research. Both the leaf and root of the Dandelion is very nourishing for the liver, which is critical during pregnancy. A lack of strong liver function is connected to morning sickness, hemorrhoids, constipation, heartburn, indigestion, lack of energy, headaches, and mood swings. Dandelion is rich in many nutrients, vitamins and minerals such as calcium, iron and vitamin A. This plant helps control blood pressure by reducing excess fluids in the body as well as by the presence of mannitol, a substance commonly prescribed in Europe for hypertension. Dandelion contains all the nutritive salts for the blood. It restores and balances the blood so anemia that is caused by deficiencies of these blood salts disappears. It also contains bitter compounds that enhance the efficiency of the body’s eliminative and detoxifying functions. These compounds help restore normal liver function, increase the production of digestive fluids and enzymes, particularly bile, increase the flow of urine and have a laxative effect… all very important functions that should be in good working order during pregnancy! Finally, this amazing weed enriches breast milk in nursing mothers. Oatstraw: Another herb I added into the mix, Oatstraw is an excellent herbal source of magnesium. Magnesium deficiency has been linked to menstrual disorders, irritability and poor calcium absorption. This herb has been used to treat hysteria, calcium deficiency, nervous disorders, urinary tract infections and osteoporosis. It is useful for bone building (vital for mama and baby) and is a nerve tonic. Wow, was all that amazing or what?! I’m sure you are ready to order all those herbs like I was after learning all that. I bought everything except the Red Clover Blossoms from the Bulk Herb Store. I love their prices, excellent customer services, fantastic quality and all the ingredients you need are organic! The Red Clover Blossoms I bought from Mountain Rose Herbs because it has primarily blossoms, while the Red Clover Tops at Bulk Herb has both blossoms and some leaves. Another good thing to remember is that you don’t need to wait until you are pregnant to start drinking this wonderful tea. Start drinking it now to heal and prepare your body! Plus, this is a great tea to share with your man and older children to increase overall health for the whole family. If you decided to buy everything in bulk you can just mix what you need and have enough to last through your pregnancy and even through nursing. You will have extras of each herb, but they can be used for other things. Second option is to simply mix everything together with only some herbs leftover, which is what I did. I made a HUGE batch of it about 2 years ago when pregnant with Tobi. I had so much leftover that I was able to give some away as gifts to other pregnant mamas… yeah, putting this tea in a dressed up jar made wonderful gifts! Third option is to simply order Bulk Herb Store’s already made pregnancy tea if making your own seems too much for you right now. Either way, you will still be getting important vitamins and minerals needed for a healthy pregnancy, labor, birth and postpartum health! Mix everything together in a large bowl or pot. Store in airtight containers or jars in a dark, cool place. Hot tea: add 2-3 teaspoons of the premixed herbs to 1 cup of boiling water. Let it steep for up to 10 minutes, cover the mug. Strain and add raw honey or stevia to taste. Cold tea: To make a pitcher of cold tea, add 10-12 teaspoons of the premixed herbs to 8 cups of boiling water. Let it sit for a while (30 minutes up to 4 hours for maximum absorption of the vitamins & minerals), strain and add raw honey or stevia if desired. Discard the used herbs, and put the tea in the refrigerator to drink over ice or it can be reheated. Herbal ice cubes: Pour finished and cooled Super Happy Belly Tea into ice cube trays. Put in the freezer. Pop them out when frozen and put some in your quart of pregnancy tea for the day. I love this method because I can iced my tea using herbal ice cubes and it won’t dilute the flavors! My midwife said to drink at least a quart or more everyday and to drink it slowly throughout the day. That’s hard to do when this tea is so good and I often drink more than a quart a day! Also, it has been said that it is best to start drinking small amounts during your first trimester, then increase it to a quart by your second trimester and to drink it through the third trimester. If you have been drinking this tea before you became pregnant, don’t stop drinking it! Simply decrease the amount to a half quart or so until you are in your 2nd trimester and increase it back up to a quart or more each day. Hope you will enjoy this tea as much as I did! Also, the links above are my affiliate links and I will earn a small commission if you decide to order the herbs through those links (no charge to you!). Thank you for reading this and supporting my family through your purchases! I just LOVE that you are doing this series! I’m going to the bulk food store this week, armed with this shopping list! Thanks for sharing. Did this eliminate your morning sickness or just ease it? Anonymous – it didn’t completely eliminate it, but it really helped ease it. Especially if you started drinking it before you became pregnant. If you really want to pretty much eliminate the morning sickness, the best thing to do before you are pregnant is to do a liver cleanse. Often morning sickness is related to the liver. Bulk Herb Store has a great liver cleanse that my husband is doing right now. I have a question about your measurements…is it by weight or volume (lbs or cups)? Its by volume (cups). Thanks for clarifying… should put that on the post. Thank you so much for this! My husband and I are hoping to get pregnant with baby #2 now. I’m doing some research about what I can do to make this pregnancy easier and healthier for myself and our baby. What tea would you suggest for those who are trying to conceive? Pretty much all the herbs are excellent for overall woman’s health and help with with the functions. Haha!! 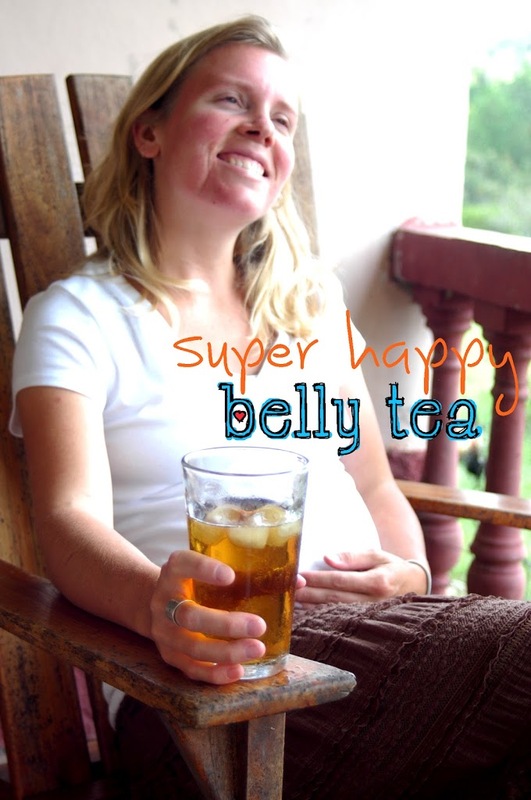 Don’t worry… when I first started out making my own Happy Belly tea… I did the same thing and had so much leftover. I basically gave some away, but I also stored a lot in air-tight containers and the tea lasted me through my third and fourth pregnancies! Enjoy!!!! Thank you very much for sharing this recipe! I just made my first batch today. My husby and I are going through an IVF cycle in March, so I am doing everything I can to prepare the soil so to speak. I couldn’t do the liver cleanse because we have recently been going through some IUI cycles, but I did get a liver supporting tea from the bulk herb store so I am hoping that helps. I also loved your supplements post. I had already been taking the cod liver/butter oil, probiotics, prenatal with folate, ACV, and coconut oil, but I was really excited to learn about the spurlina(sp?) and kelp as well! I actually bought the powders and encapsulated them myself. I definitely need some more practice doing that, but I got about a week’s worth created, so I can perfect that over the weekend.  I am going to be checking out your post on homeopathy next, it looks really interesting. I already follow a paleo/WAP way of eating. I think I was definitely meant to find this website! I’m enjoying your blog, and I love the missionary work you and your family are doing. Keep up the good work! Hello Jenn! So glad you stop by and using my recipe! Thank you for sharing your story and it sounds like you guys are doing everything you can to prepare your body. I hope things are going well for you now! Thank you and stay in touch! Hello Marilyn, this is such a very informative post and great collection of links! I myself also research about good herbs for pregnancy and even create a list for one. It’s nice to see fellow bloggers do the same and even better. Cheers and more power! How much did you purchase in bulk for each ( 1lb, 4 ounces, or 8 ounces)? Im up to $50.00 so far. Im assuming if im buying 8 oz or 1lb for each herb this should last for while! All the herbs I purchased were 1/2 lb each. Yes, you will have lots leftover, but they make great gifts for other pregnant mamas. I made a batch of this stuff when I was pregnant with my 3rd and it lasted until I was pregnant with my 4th. I stored it in a cool, dark, dry place in sealed jars. I have one month left of my pregnancy but just came across your recipe. Would it be fine to make and start drinking a quart each day from here on out or should I start with smaller amount since I haven’t taken before? Also is it good to do throughout nursing and beyond or keep it mostly to pregnancy and a little pre-pregnancy as you prepare? Would rose hips be ok to add? Is it ok to only use this during pregnancy instead of prenatal vitamins? I’m trying to research on best one and not sure which is best . Hello Darina! So wonderful to “meet” you! Yes, rose hip is good to add for extra vitamin C if needed. You can drink the tea without prenatal vitamins, but take care to watch how you feel. Sometimes you might need a boost of something that the tea might not provide enough of. Also, you should take a look at my Pregnancy Notes on Homeopathy. There is an homeopathy alternative plan you can take instead of vitamins. THANK YOU, THANK YOU, THANK YOU!!!! I started using this tea recipe during my second trimester and I have to say that it has done miracles for me! I now recommend it to everyone I know and then some. It has done wonders for my leg cramps, my energy is beyond belief and I definitely know that it’s doing my baby good because he’s so active and always moving around! Once again THANK YOU for sharing such an amazing tea! Hello Diana! I’m so glad the tea has been so helpful for you 🙂 Hope all goes well during the rest of your pregnancy and the birth. Blessings! Thank you for this recipe! I used it during my last pregnancy with my daughter and now this one. I have been experiencing my tea tasting a little bitter though. I follow the direction and use the right amounts. I’m not sure what I am doing wrong. Any suggestions? Are the herbs fresh? It could be a herb has gotten old. Try not to let it seep too long. Hope that helps! Thank u soo much for sharing this with us. One question i am already taking my prenatal vitamin can i drink it and also take my vitamins and how many cups a day? “My midwife said to drink at least a quart or more everyday and to drink it slowly throughout the day. That’s hard to do when this tea is so good and I often drink more than a quart a day! I know this is an older post, but I am wondering what your knowledge is regarding this article, http://drbrewerpregnancydiet.com/id86.html, which is very thought provoking about the DANGER of using any herbs in pregnancy that can be used as diuretics (alfalfa, nettle, dandelion, etc.) & the fact that such herbs can cause an imbalance of water & blood volume, leading to complications? Do you have any master herbalists you know who could confirm or deny this information? Hi there! I’m sorry for not replying sooner. I read the article and I’m not sure that I believe it because I have drank my super happy belly tea through 4 pregnancies with wonderful results. I always made sure I drank plenty of water and sipped the tea throughout the day rather then drinking it all up quickly. I will share this article with a few trusted mentors and see what they say. Thank you for sharing! health ful recipe for pregnant womens,,,!